When it comes to iris perfumes my opinion is that more is more, and even that is barely enough. I've already told you that I've been hoarding the last of my Iris Fauve sample so I can drench myself and get the full experience. It was worth it. It's also a very good way to understand what makes the newest Atelier des Ors a fauve-style creation, something that was not fully apparent to me the first few times I've worn it. Iris Fauve creates a first impression of a soft musky iris perfume. It's when you're fully immersed in its world that the broad and forceful brushstrokes reveal themselves and distinguish the fragrance. It's almost a complete opposite of another musky iris perfume, Parfums DelRae's Mythique. The latter is soft and powdery, sheer like a tonal watercolor of an early spring garden, celadon and lavender blue with a bit of periwinkle thrown in. In contrast Iris Fauve comes at you with slashes and splashes of primary blue and red, blades of green grassy vetiver with its tips on fire. I do not have synesthesia, but I often experience perfumes as an image, color, and/or texture. It's rarely more intense than with this perfume. Iris can be buttery, powdery, earthy, leathery, damp, or dry. Iris Fauve is none of these. It's hot and cold (see red and blue), crystalline at first before you fall into it, like in a dream sequence, finding yourself engulfed in musky pillows and duvets, savoring the sensation of familiar safety. When you cloak yourself in Iris Fauve all of it comes together: prickles of spice and dry vetiver, the warmth of wood and clean yet very human labdanum, and above all that beautiful iris. Longevity is excellent on my skin (given a generous application). The thick and complex musk has vegetal and animal facets that trap it between body and fabric for at least half a day. I wonder what would happen if I ever get a bottle and can spray Iris Fauve in my hair: will it become a floral cloud around me or appear slightly unwashed and costus-like in the best possible way? The first time I smelled it I suspected there was costus in the blend, but it was most likely the dirtier aspect of musk. As you can tell, I keep losing myself in the world created around me by Iris Fauve. It's satisfying and intriguing at the same time. How often can we say that about a new fragrance? Iris Fauve by Atelier des Ors ($275, 100ml) will launch in the US next month at OsswaldNYC and Luckyscent. For more details and reserving a bottle I'd recommend calling ahead (212- 625-3111). I got my samples during the Atelier des Ors event at Osswald late last year. 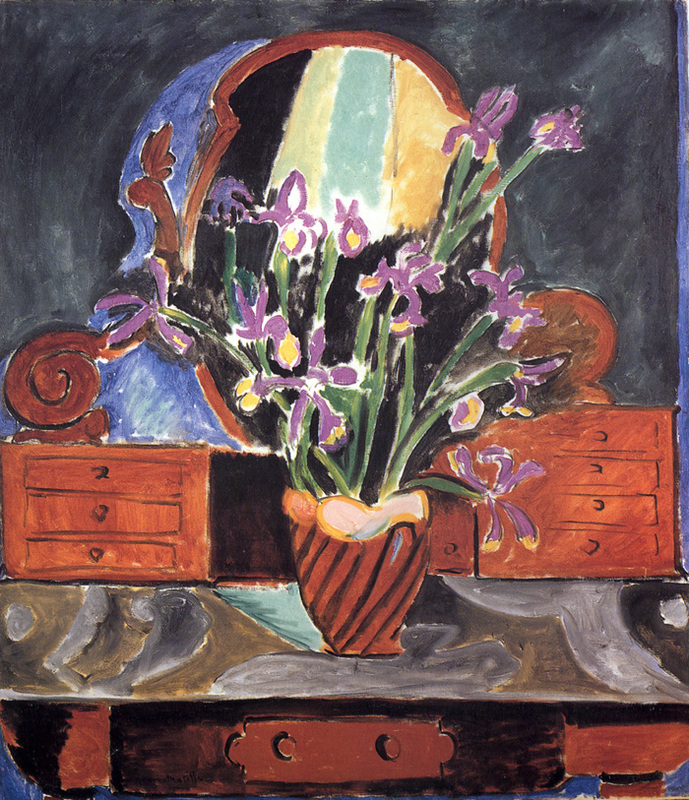 Art: Henri Matisse, Vase With Irises, 1912.